Like most people, for me, a Chinese meal is something you eat in the comfort of your own home in front of your TV, not something you would necessarily go out to eat, so when Yelp Glasgow organised a trip to Sichuan House on Sauchiehall Street, my expectations weren’t exactly sky high – but they should have been! After looking at the menu online, I was a little scared as it was full of strange dishes that included things like jellyfish, pork intestines and frogs legs! I’m told these dishes are all quite traditional, as when Sam saw the menu, he got very excited. Having lived in Hong Kong for four years, he thought the menu looked really authentic, so I was interested to see if it would live up to his expectations. The décor in the restaurant is very simple but elegant, all focused on a red and black colour scheme, with marble table tops and simple place settings – chop sticks only! We were given the menu and because there was such a big group of us, were offered the option of a banquet, where carefully selected dishes would simply be brought to us in waves so that we could sample lots of different things. Unfortunately it was a little bit pricey and not to everyone’s budget, so we ended up ordering individually. I went for pork dumplings to start, while Sam opted for Salt & Chilli squid. 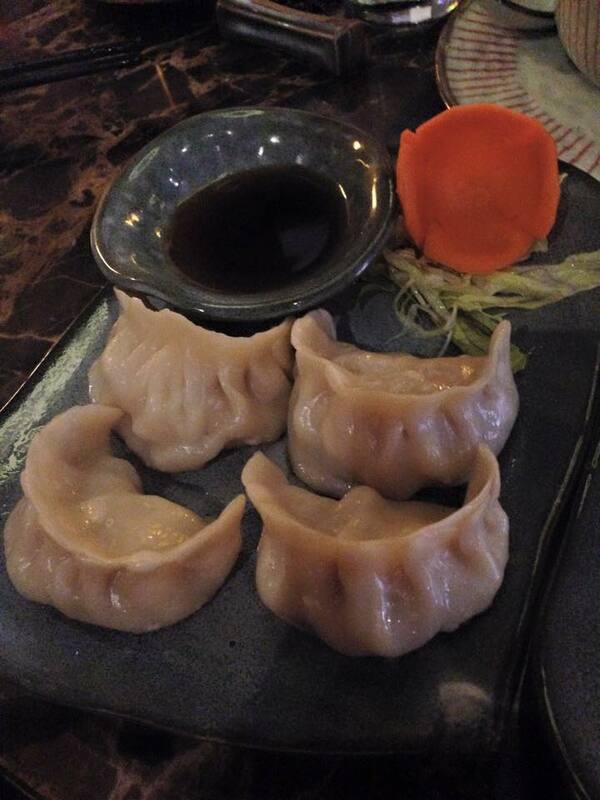 The dumplings came as a quite substantial portion of four, with a Chinese vinegar dip. They were steamed and finished off in the pan, with a nice crunchy side and a flavoursome, meaty filling. 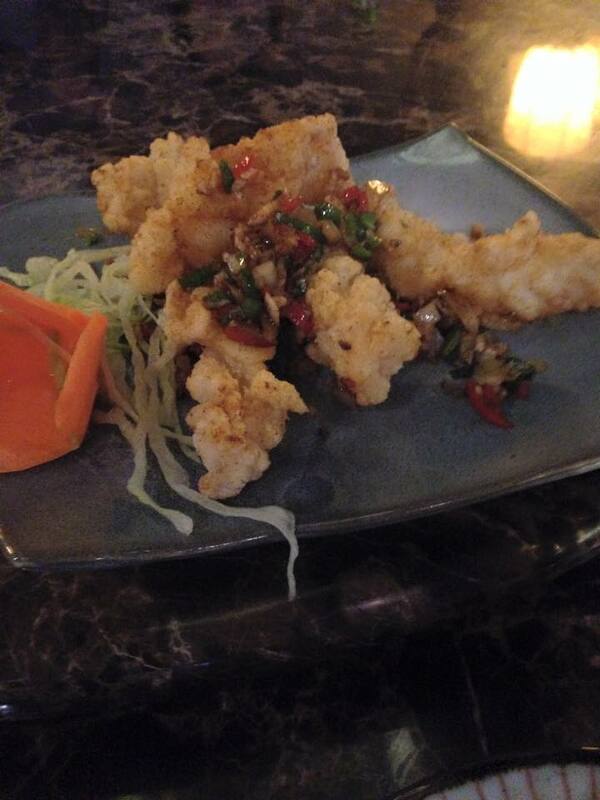 Sam’s squid was beautiful – lovely and crisp, spicy and salty. I think a lot of the people on the table were jealous of it! For our main course, Sam and I decided to order half a Peking Duck. 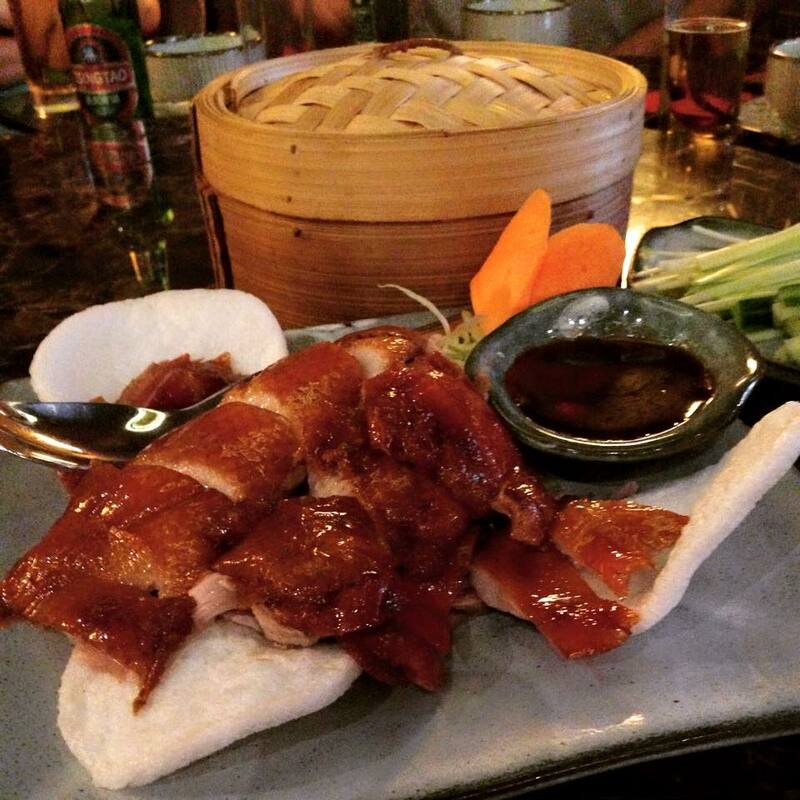 This isn’t like your normal, crispy aromatic duck from the takeaway; this is a more traditional version which serves the succulent and yummy breast meat on a platter, with a super crisp, browned skin, along with pancakes, cucumber, spring onion and hoi sin sauce. They then told us that the bones could either be used to make a broth, or salt & chilli style. We opted for salt & chilli, and they almost stole the show. The wings and other bones had been covered in the same salt and chilli mix that Sam’s squid had, and then deep fried so it was super crisp. It was delicious! On the side we had also ordered the Singapore Rice Noodles, which in hindsight we really didn’t need, but they were very tasty and filled with chicken, pork, prawns, peppers and chillies. Surprisingly, we somehow ended up ordering dessert as well! I ordered Strawberry & Prosecco sorbet, while Sam opted for a massive chocolate brownie sundae, complete with sparkler! The ice cream came from Equi’s, which has a reputation for providing great quality, and it was tasty but I was instantly filled with regret for eating so much! We do not have any great take-out Chinese restaurants in our city so I only eat it when traveling and in the restaurant itself. I envy folks with lots of Chinese choices for take out. Always fun to eat and watch a movie!